Sean McHugh and Kathleen Kennedy in action in the Galway International Rally. Photo: Alan Maguire. For many it was the first competing event of the year, it had promised to be an exciting day for both competitors and spectators and it did not fail to deliver with a top class entry list, including World Rally Championship Driver, Craig Breen, who, with navigator Paul Nagle, competed in a Ford Fiesta R5. In addition to a large number of members who were helping out as marshals, there were four competing cars. Charlestown’s Ronan Denning and Karl Egan were in the International category in their Peugeot 208 R2; in the National category Sean McHugh and Kathleen Kennedy were competing in a Subaru Impreza; Crossmolina’s Brian Moore and Lorcan Moore were competing in the Junior category in their Honda Civic and Aaron McHale and Enda Sherry were competing in class 24 in a Hyundai I20 R5. It was a challenging event for all, the rain and windy weather in the days leading up to the event made road conditions wet and muddy. Aaron McHale and Enda Sherry had a steady day out, they maintained their position on the road all day and finished second in class 24. 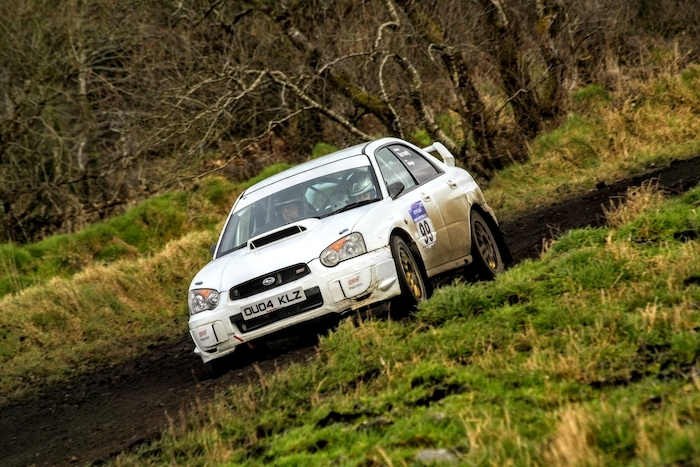 Sean McHugh and Kathleen Kennedy finished third in class 15 and were thirtieth overall in the national rally. Brothers Brian and Lorcan Moore had a disappointing day, they dominated the junior rally from the first stage up until stage five, when their engine gave up and they had to leave the rally early. Ronan Denning and Karl Egan started well, they had some issues on the first loop and on stage six they hit a wall and damaged a radiator, which put an end to their event. They are back in action again at the West Cork Rally in March.